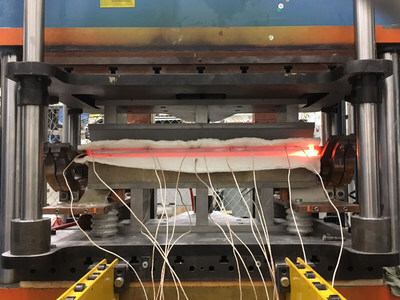 WICHITA, Kan., July 18, 2018 /PRNewswire/ -- Spirit AeroSystems today announced its researchers are working to commercialize a new proprietary method for shaping titanium raw material at elevated temperatures in the fabrication of aerospace components. The Joule FormTM process, which Spirit has trademarked, provides the company a competitive advantage in the use of titanium, a highly desirable material thanks to its combination of strength and light weight. "The Spirit R&D team is constantly looking at new and innovative ways to support our customers. It's one of our differentiators in the marketplace for aerospace structures," said Spirit President and CEO Tom Gentile. "The Joule FormTM process allows us to increase utilization of titanium markedly and ultimately decrease machined-part cost to enhance Spirit's competitiveness further. "Returning value to our customers is one of the focuses of our R&D team," Gentile added. "We want to ensure that we are building the highest quality products in the most cost effective way. Sometimes that means adding automation, sometimes that means developing a new process or working with a new material."